Bubba Watson claimed his third victory of the season at the Travelers Championship as overnight leader Paul Casey stumbled on the final day. 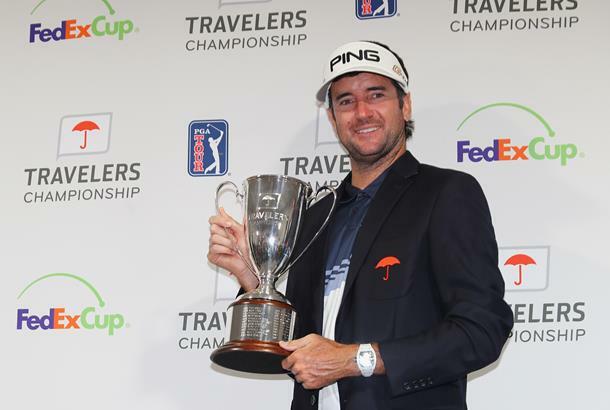 Bubba Watson carded a final-round 63 at the Travelers Championship on Sunday to win his third PGA Tour title of the year, and third victory at this particular tournament. Watson began the day six shots behind leader Paul Casey, whose impressive third round 62 gave him a four-shot advantage over the rest of the field. But as the Englishman battled with his game on the final day to a two-over 72, it was Watson who made the most of his birdie chances as he claimed a three-shot victory over Casey, JB Holmes, Stewart Cink and Beau Hossler. He didn't get off to a particularly fast start, making back-to-back birdies on the fifth and sixth holes before dropping a shot on the eighth after pulling his tee shot in to the left rough. Still five shots off the lead, it was at the turn that the momentum started to swing for Bubba. He nearly drove the par-four ninth hole to guarantee a birdie, before sinking a 50-footer at the next to move within three. More impressive displays on the 12th and 13th greens moved him to within one, and he went on to tie the lead thanks to an up-and-down from the sand on the driveable par-four 15th hole. A final roar met Bubba on the 18th as he nearly holed out for eagle, putting the pressure on the now chasing back as he grabbed the clubhouse lead on 17-under-par for the tournament. Meanwhile, overnight leader Casey was left scrambling for pars throughout his round. The 2018 Valspar champion had opened up with a birdie but failed to find another gain the remainder of the day, bogeying the par-three 5th hole and holing several clutch putts for par - the most memorable of which came with a 30 foot save on the 10th after his drive nestled up next to a tree. Standing on the 16th green Casey was still one shot adrift of Watson and needing something to happen. Instead, he missed from inside four-feet for par and then put his fairway wood in to the water on the next for back-to-back bogeys. A par on the last left Casey in a share of second place with Holmes, Hossler and Cink on 14-under, the latter of which had matched his career best score of 62 on the final day at TPC River Highlands. Holmes ended up with the best chance of forcing a play-off, but was unable to find a birdie on the last few holes and instead made a mess of the final hole, dropping back in to a share of second with the others thanks to a bogey on 18. There wasn't any fireworks on the final day from Jordan Spieth this year, but Jason Day chipped in from the rough at 18 to finish in a share of 12th with Rory McIlroy, who birdied two of his last four holes. The defending champion finished 13-shots behind Bubba Watson in a tie for 42nd, while US Open champion Brooks Koepka ended up in a tie for 16th.